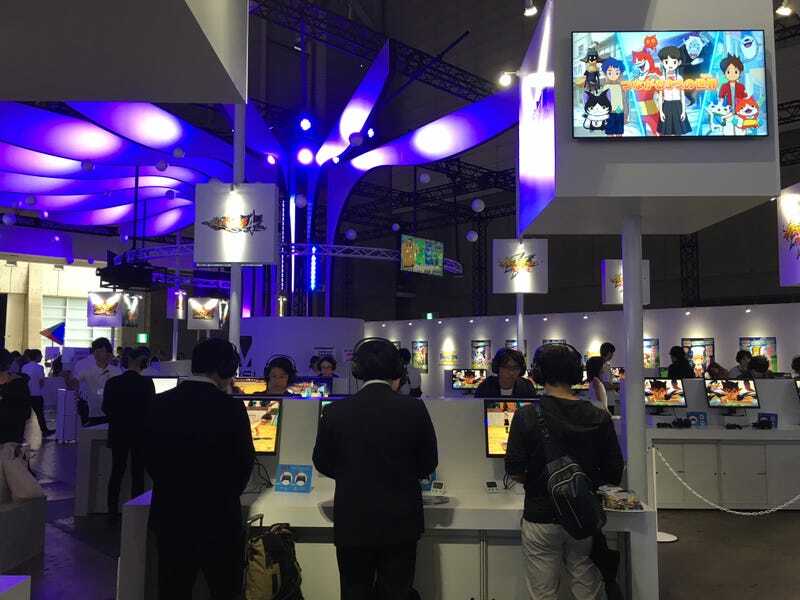 In 2014, Yokai Watch’s popularity exploded in Japan. The 3DS game and its anime became a nationwide phenomenon, with kids singing the theme song (and doing its catchy dance) and begging their parents to buy them Yokai Watch toys. It seemed like Yokai Watch was on track to surpass Pokémon, but by late 2016, the fever had passed. Yokai Watch, while popular, was no longer the cultural juggernaut it was previously. Enter Yokai Watch 4. The first three games in the series were cutesy role-playing games for the Nintendo 3DS, but the latest sequel is more grown up and headed for the Nintendo Switch. The original Yokai Watch anime ended earlier this spring in Japan. A new, darker series called Yokai Watch Shadowside took its place. Shadowside is set several decades after the original series and stars the children of the protagonists Nathan and Katie. In Yokai Watch 4, portals connect the characters (here, the kids and the kid-version of their parents) in different timelines. In the demo, players first explore the town as female protagonist Natsume and then as Touma Tsukinami face off against a boss yokai named Jingeki, a possessed human-body model, with a party of friendly yokai cohorts. I controlled Touma, while the other members of party were AI. Combat-wise, the ranged attacks Touma uses were supernatural, while he could punch for close-quarter fights. The polished suburban setting of Yokai Watch 4 was evocative of earlier games, but thanks to the Switch, it looks better than ever. It’s an enjoyable place to be, and if you want to know pretty much exactly what a new Japanese suburb looks like, get this game. The art style in Shadowside is more menacing than in the original Yokai Watch, which gives this game a much needed edit. The world of Yokai Watch, even in its adorable iterations, has always been slightly sinister and sad. I hope Yokai Watch 4 can bring that out even more. The yokai design is still inventive and appealing. Yokai Watch 4 ditches some of the grade school cuteness of its original and seems aimed at slightly older players—or rather, its previously younger fans are now junior high and high school students. It’s nice to see a series willing to change with its audience. Perhaps Yokai Watch has no choice.